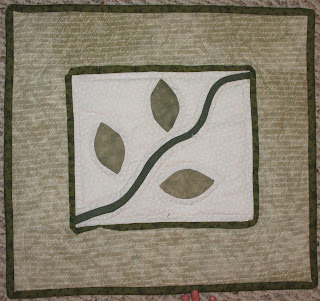 Fabrics: The leaves and stem piece were provided by the class teacher, a friend from LBCQ. Thoughts: This is one of my first attempts at machine quilting - I only had a walking foot back then. 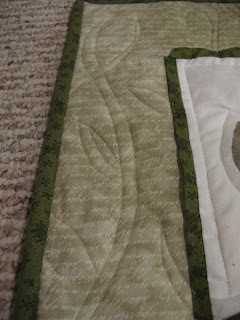 I wanted to continue the stems and leaves into the quilting. This is actually a bit of an emotional wall hanging. The leaves that my friend provided were leftovers from a quilt that she made while sitting in the hospital at her husband's side. Using the same pieces that my friend did during a very hard time in her life reminds me that life is precious. I just can't take it for granted. My friend's quilt (called Lifelines) and her story is in the book Little Bits of Comfort.